It's the most wonderful time of the year! I LOVE Christmas trees! It's so much fun to decorate them and see all of the interesting ways others decorate their trees. 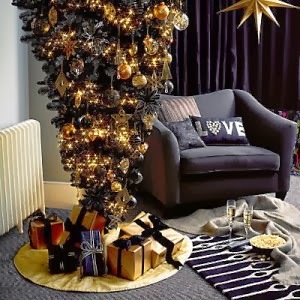 Here are a few savvy Christmas trees I'd like to share you. Enjoy! Now here is an interesting new trend that's all the rage this year. The Upside-down Christmas tree. I like the purple and gold theme here. Cute! Christmas with pink, purple and blue.